Kremer Pigmente Oil Varnishes are lightfast, translucent and applicable for wood surfaces and violin making. They are handmade in the Color-Mill in Aichstetten. The cooked resin Oil Varnishes come in 6 different colors and are ready to use. Chemically Iron Oxide Yellow is a synthesized hydrated iron oxide with the general formula Fe2O3·H2O. Oxide Yellow has a very fine, soft quality and is very easy to use. Besides it is completely lightfast and suitable for all techniques. The pure and technical homogeneous pigment is a substitute for natural ocher. The use of ochres in standardized color production is not that easy, because of their different shades. So natural ocher is often processed with Iron Oxide Yellow. Translucent iron oxides are very stable, iron oxide-based pigments for transparent applications. Their glaze colors are very pure and intense, but they must be mulled for full effectiveness. Synthetic iron oxide pigments have a higher color purity and brilliancy than the red-brown natural earths. Chemically, these iron oxide pigments are classified as Iron-III-Oxids (Fe2O3). Iron Oxide Red can be gained by heating Iron Oxide Yellow up to more than 180°C. 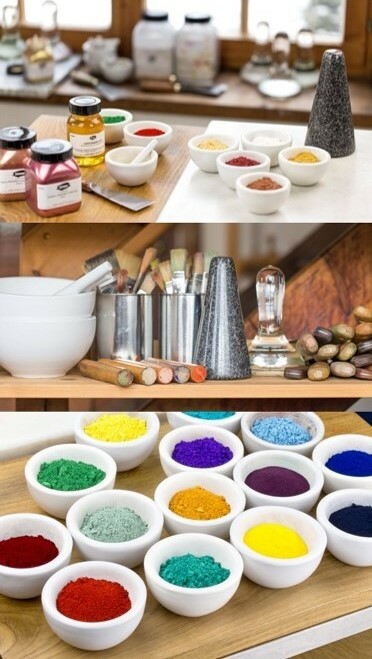 All iron oxide pigments are very lightfast and suitable for all techniques. They also absorb UV light, which implies that the pigment protects the binder and other contents in color against degradation by sunlight. Madder Lake is an anthraquinone originally derived from the root of the madder plant. 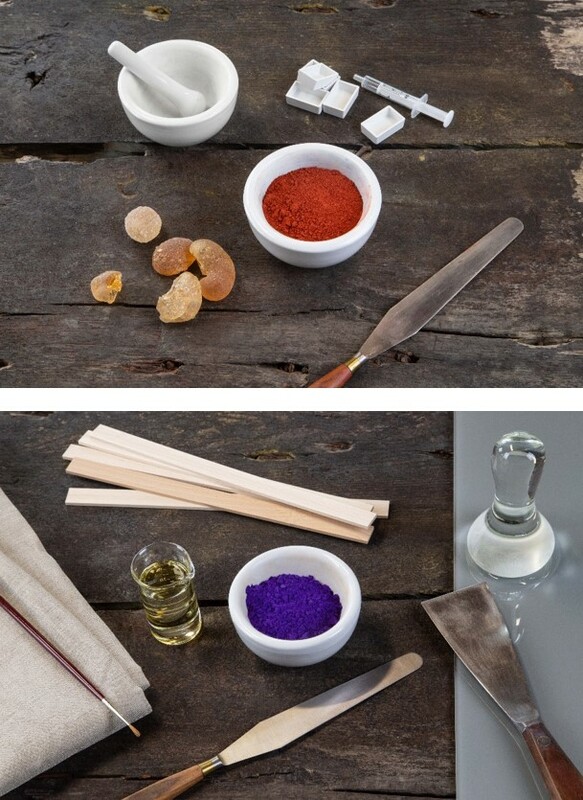 It became the first natural pigment to be duplicated synthetically. Madder Lake was used in ancient Egypt, Greece and Rome for dyeing textiles and, to some extent, for making pigments. Synthetic alizarin was first made in 1868. In the following years, Madder Lake was superseded by alizarin crimson, a pigment superior to it in every respect. Synthetic alizarin did not replace natural madder immediately. Today, most painters prefer alizarin, but a few artists ́ colors made from rose madder can still be found among the European brands. Both the old natural alizarine Madder Lake as well as the modern alizarine are completely non-toxic. Paliogen® Maroon is a deep dark red shade which exceeds the famous madder lake. It belongs to the new generation of organic pigments and is part of the perylene dye group. The Paliogen® Maroon hue is most intense when applied pure but also leads to powerful effects when mixed with other pigments. Gubbio Red is a modern synthetic organic pigment. The transparent reddish brown color is suitable for all techniques. The lightfastness is very good. Our recipes will give you a guideline on, how to produce your color according to your individual requirements. Immerse yourself in the world of watercolors, egg yolk, wall paints, oilcolors, acryliccolors and further pigment applications. Also have a look at our recipes-site. Photochromic Pigments change from colorless to colored when stimulated by UV light (365nm) or strong sunlight. Once the powerful light is shut down the powder turns colorless again. Photochromic pigments are specifically designed for use in non-aqueous based ink systems although their use is not limited to this. They can be used to formulate Flexographic, UV, Screen, Offset, Epoxy, and Gravure ink formulations. 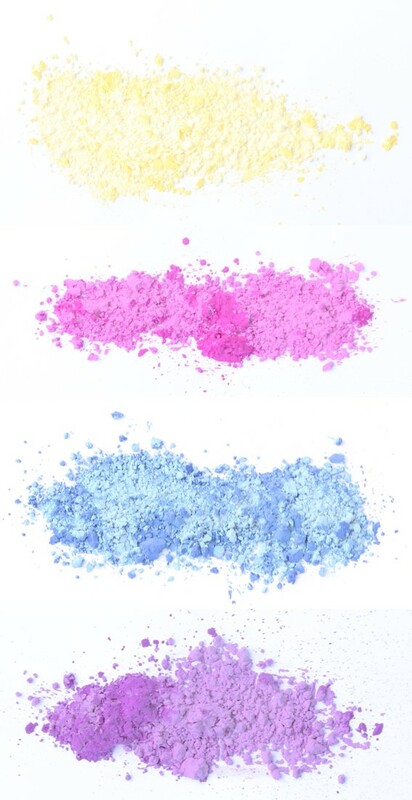 Photochromic powders are colorless in their inactivated state and become colored when exposed to an ultraviolet light source. It should be noted that there are differences in performance of the various colors so that each should be tested prior final application. Photochromic pigments have excellent stability when stored away from heat and light. Store below 25C and prevent from freezing. Long-term exposure to UV light should be avoided. Any kind of paint will need a certain time to dry. Most paints will not dry at very low temperatures, but even too high temperatures can have effect on film formation. The drying time of acrylic paints depends on the type of dispersion, layer thickness and climatic conditions. A 1 mm thick paint layer may easily need a whole week until it is dried through, thicker paint layers will need even longer. Therefore, many artists nowadays use a hair dryer to accelerate drying. Warm, dry air will accelerate the drying process, but it is not advisable. The heat and fast drying will cause acrylic monomers, solvents and other additives to evaporate from the paint. This can cause the paint film to harden, get brittle and enhance yellowing. Exposure to these vapors can cause serious health damage, therefore we advise against the use of hair dryers or other heating equipment on acrylic paints! Solvent dyes are suitable for transparent print colors, for printing inks, for wood stains or for coloring compounds, epoxy and polyester resins. Solvent dye pigments are soluble in most solvents. They are very brilliant and stable. All solvent dye pigments are easily soluble in a mixture of 80% ethyl alcohol (#70800), 5% water and 15% Methoxypropanol PM (#70920). For most applications 1-5 g are sufficient for coloring 1 liter. Available with order number #94080.